This blanket was made from a pack of MODA sample fabrics that was sent to me by my Aunt Ginny. She was cleaning out her stash and sent me two big boxes of fabric, books and supplies – so fabulous! These fabrics were obviously meant to be made into something for a baby, so I made this quick and easy blanket. There is no batting and it’s backed with a micro fleece. I then used embroidery floss to hand tie the two layers together. It’s so soft and lovely. The only problem is that this blanket is very girly looking and all of the babies I have to gift for are boys! Ah well. I think I’ll list it in my long-neglected Etsy shop and if nobody buys it before I know a new baby girl, then I have an insta-gift. This is an embroidered onesie that I made using a pattern from Sublime Stitching. I received a pattern book as a birthday gift this past December and this was my first time trying it out. I love hand embroidery and I love how easy it is to whip up a few onesies for baby gifts. 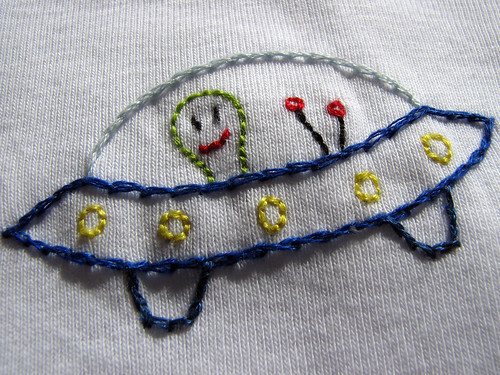 And I love how cute this little alien is! Just perfect for a little baby boy. Look awesome.Gourmet Chocolate holds online gifts. This blanket is just precious. 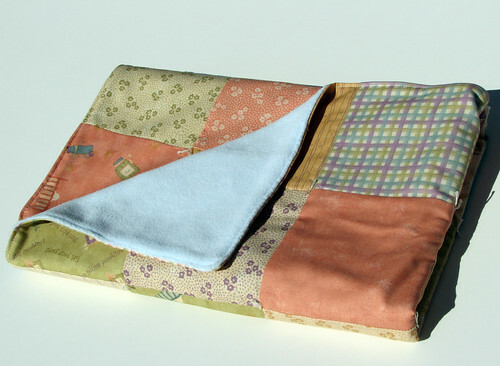 It reminds me of the keepsake blanket I received for as one of my baby gifts I kept for years!